I am very impressed with Meaco’s range of dehumidifiers and air purifiers and I am therefore only delighted to review the Meaco 10L Small Home Dehumidifier. The previous Meaco dehumidifiers which I have reviewed on ByeMould, the Meaco DD8L and the Meaco DD8L Junior, were both desiccant dehumidifiers. 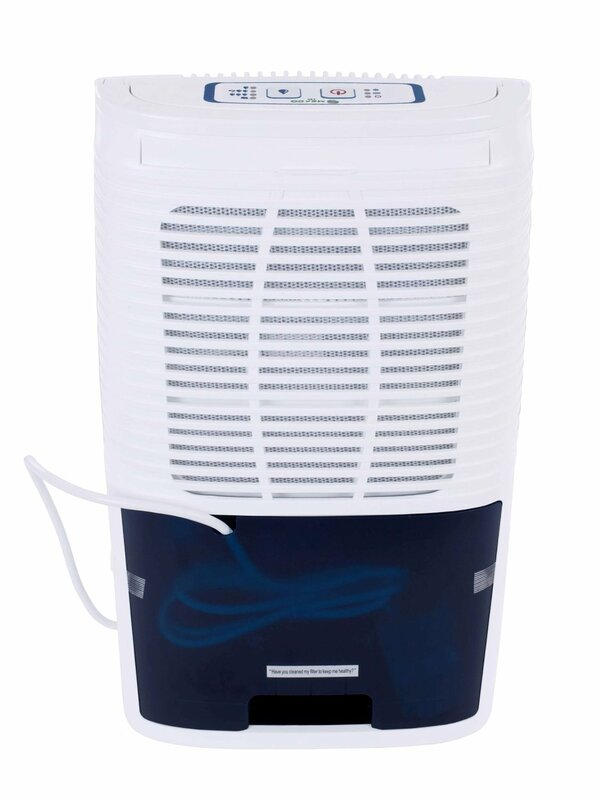 The Meaco 10L Small Home Dehumidifier is a compressor dehumidifier which is typically a heavier and noisier type of dehumidifier than a desiccant model. However we will start this review with a quick bullet point summary of the features and specifications of the Meaco 10L Small Home Dehumidifier. We will then compare prices between the top retailers which will be followed by an in-depth review. The filter is a standard dust filter as would be expected for a unit of this purpose. Located at the rear of the unit the filter is easily removable for cleaning. The plastic water tank holds 2 litres of water and is located on the lower rear of the dehumidifier. Unfortunately there is no plastic water view window on the front of the unit which would allow you to view the water level without having to rely on the ‘water tank full’ indicator which alights when the tank is full. When the water tank is full the dehumidifier stops automatically and will resume operations once the tank has been emptied. The Meaco 10L Small Home Dehumidifier comes with a continuous drainage option which allows you to leave the dehumidifier running continuously as the water tank empties automatically in a sink or other drainage device. The continuous drainage feature is very handy for use in caravans, boats, sheds and garages etc and the Meaco 10L comes with a drainage hose for this purpose.. Stated extraction level is around 10L per day however you will probably find that your extraction levels will be lower than this especially in lower temperatures. This is a typical situation in the UK as our humidity and temperature levels are generally lower than the climate that the dehumidifier was tested in. The control panel features soft push buttons which give the unit a nice modern look. In the centre of the control panel are two large buttons. One that lights up when the power is on and the other which you push to turn the unit ‘on’ and ‘off’. Strangely the lowest setting, identified by a water droplet, only controls relative humidity at around 80% which is much to wet for healthy living. You in all likelyhood not need this setting and I am not sure why it has been included. The next setting, identified by two water droplets and a thumbs up figure, sets the dehumidifier to work at around 60% RH. This is the setting which you will use most often. The third setting, identified by, you guessed it, three water droplets brings the RH down to 40% before the unit switches off. The final setting is a ‘Laundry’ mode which is ideal for drying clothes indoors. On the extreme left off the control panel there is a light that turns on when the unit is working. Beneath that is the ‘Water Tank Full’ indicator which lights up when the water tank is full and below that is the ‘deicing’ light. In colder temperatures the rods of a compressor dehumidifier may freeze up. If this occurs the Meaco 10L Small Home Dehumidifier will defrost and perate again for 40 minutes before deicing again. On a whole the control panel is easy to understand and operate. The Meaco 10L Small Home Dehumidifier comes with a standard one year warranty however upon purchase you have the option of extending the warranty by up to 5 years. Competition in this market segment is very high and the Meaco 10L Small Home Dehumidifier does a good job at competing with its rivals. Knowing that Meaco uses great technology you could consider purchasing this dehumidifier if you are looking for a small home solution. The Meaco 10L Small Home Dehumidifier rates at 4.5 / 5 stars on Amazon which is very good for a dehumidifier. Did you find this Meaco dehumidifier review beneficial? If you have any questions please let us know in the comments below.